Modern telecommunications networks often comprise multiple heterogeneous elements. 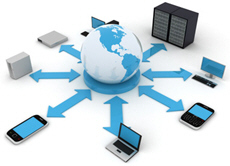 Moreover, multi-vendor equipment of intelligent networks implements various technologies. It is not an easy task to effectively manage such a network, ensure continuous delivery of subscriber services and prompt customer care (crediting pay-ments to accounts, notifications, and so on). Lack of centralized control over network elements inevitably results in problems with service management coordination and extra costs. It also involves risks of partial loss of information on emergencies, performance degradation, and, consequently, low lev-el of QoS. CBOSSnetInventory- PSTN Inventory Management System – streamlines the operation of all PSTN-oriented departments. The solution supports prompt installation feasibility analysis, repair office automation, automated line testing, network topology analysis and development. CBOSStmn – Telecommunications Management Network – is a centralized system processing alarms from network elements: telecom equipment, servers, intelligent systems from various manufacturers, voice channels, signaling links, etc. The solution provides remote failure registration, diagnostics and troubleshooting, enables timely decision-making, and prevents malfunctions from becoming an emergency. CBOSSmdCDR – Automatic CDR Collection System – supports “hot” call rating. CBOSSmdDrive – External Resources Management System – enables automatic mediation between the billing system and switching equipment, SMSCs, voice/fax mail systems, SIM browsers, prepaid and IP platforms. The solution seamlessly integrates with any equipment from any vendor.